Authored by: Jerry Pubantz & John Allphin Moore Jr. The United Nations was created as a response to the suffering caused by World War II. The goal of the organization, as stated in the Charter of the United Nations, was "to save succeeding generations from the scourge of war." That goal is as vital today as it was in 1945. While other structures of the cold war era have disappeared completely or have undergone major revisions, the U.N. has gained increasing importance as a collective security response to the challenges that have emerged in this millennium. 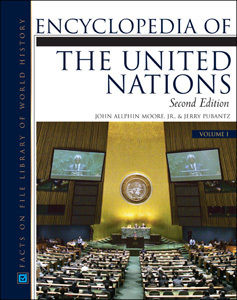 Now in two volumes, with more than 100 new and revised entries, Encyclopedia of the United Nations, Second Edition provides a comprehensive update to the United Nations's institutions, procedures, policies, specialized agencies, historic personalities, initiatives, and involvement in world affairs. This reference puts into context the past 50 years of major world events and the role the United Nations has played in them. Presented in alphabetical format, this book features more than 500 entries that include brief references, longer explanatory essays, and detailed data on the U.N. The appendixes contain important U.N. documents, such as the Charter of the United Nations, the Universal Declaration of Human Rights, the Statute of the International Court of Justice, and recent Security Council resolutions. "...a concise, authoritative, and readable acquisition for all undergraduate academic and public libraries. Recommended."